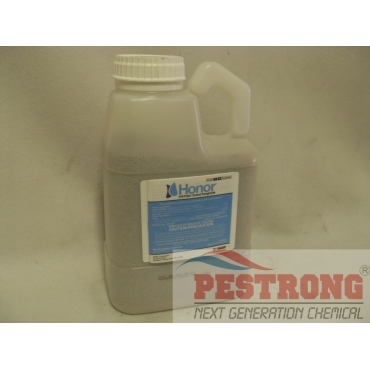 Where to Buy Honor Fungicide, Honor Intrinsic Brand Fungicide for Golf Course - 3 Lbs - $494.95 for Sale with Fast Free Shipping! Honor Intrinsic Brand Fungicide for Golf Course - 3 Lbs is a combination of pyraclostrobin, the active ingredient in Insignia fungicide, and boscalid, the active ingredient in Emerald fungicide. This new pre-mix provides two modes of action and delivers unsurpassed control of the top diseases that superintendents battle such as dollar spot, fairy ring, anthracnose, patch diseases (brown, take-all, and summer), leaf spots and many others. Intrinsic is a brand of products from BASF that provide disease control and plant health benefits. So if you need control of dollar spot and the tough diseases, as well as plant health benefits for your turf, you’ll want to use Honor Intrinsic brand fungicide. In addition to disease control, Honor Intrinsic brand fungicide also offers plant health benefits. Research shows turf treated with Honor Intrinsic brand fungicide provides improved plant health in the form of stress management. This includes drought/moisture, temperature extremes and mechanical stress such as aerification. In addition, research also shows turf treated with Honor Intrinsic brand fungicide has increased root length and density. Intrinsic brand fungicides prime the immune system of the turfgrass before an event. This helps the plant and root system endure the stress event and overcome the stress through root system retention. This product is for golf course use only. Not for use on residential turfgrass, turfgrass being grown for sale, or other commercial use such as sod production, seed production, or for research purposes. One of the most effective fungicide against dollar weed, and it noticeably improves the plant's tolerance against stresses and keeps the plant healthier it deserves every one of the 5 stars, I just love it!